Engage in search of the perfect wedding dressIt can be infinite, because every day designers offer more and more new models. If you have decided to hold a celebration in ethnic style, have to give up the white dress of the bride and stop the choice on original, creative ways. It is interesting and stylish look wedding dress, made in Russian national style. How to look ancient Russian wedding dress? The 19th century is characterized by the advent of fashion on whiteWedding dress up this bride-time adorned in blue, red, and sometimes even black outfit that was considered the norm. Almost always I wore a skirt young, festive shirt sundress. To a wedding image was harmonious and complete, was added thereto neck adornments, the special winding, which is tied to the kokoshnik bright ribbons. The ancient Russian wedding dress - a bright sundress, complete with interesting embroidery. Fashion designers offer modern bridescompromise and very interesting options - stylized white dresses that are as close as possible to the traditional Russian. If the idea of ​​folk and modern fabrics are used at the core of the bride attire, will have a chance to create not only beautiful, but also a unique wedding dress. Cape will look very interesting,trimmed with fur - it's the best version of a winter wedding dress. On the wedding before Russian girls wore dresses of red. It is considered an exotic outfit, made in the style of "ethnic." But, if you want your wedding to be not only memorable, but also original, refer to the ancient Russian traditions. 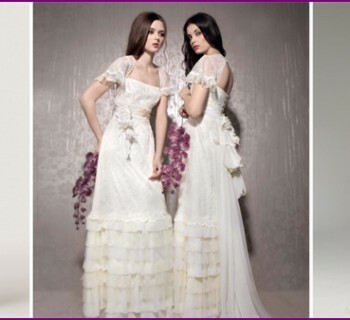 Modern fashion brides a wideselection of wedding dresses made in the Russian folk style, the main difference is that the variety of colors, richness of decoration. The outfit is complemented by a beautiful embroidery, which is mainly composed of national ornament, flower motifs, a variety of colors with the addition of gold. There is also a greater choice - the wedding dress,created manually renowned designers, decorated with thin threads, interwoven with pearls, beads, rhinestones. In the old days the young outfit had to be red, but it is now becoming increasingly popular white. Very beautiful and unusual looks crisp white dress, which has a bright accent - the insertion of the blue or red fabric, embroidery in these colors. Wedding apparel from fashion designers,made in the Russian folk style - a combination of white, red, blue. It is not necessary, they should be similar to a traditional Russian sundress. In almost all cases, the designers present their collections in fashion styles, which are used to manufacture only high quality, expensive material, supplemented by national motifs. Among the main elements of the Russian style ofexcept for the embroidery, refers fluffy skirt, the sleeves in the form of a flashlight, a long train. More and more fashion designers are brides wedding dresses A-shaped silhouette - bodice smoothly into a full skirt, extended downward. Among its advantages include the fact that it is just perfect for any girls figure. And thanks to a special cut of the dress, having a vertical line, visual figure becomes slimmer, more toned. You can choose an outfit for a celebration with a modest, opening only the collarbone, or a neckline. If you planned wedding in the traditional Russian styleIt is necessary to prepare in advance two dresses: more closed - for the upcoming wedding, and the second - for a party. Engagement also requires careful preparation. Note the modest and popular option - Dress A-shaped silhouette, which is well suited to a hen party. It features not only an abundance of colors, but alsounique luxury. Women of fashion are a wide number of classical options of styles with a high waist and wide straps. This can even wear a sundress pregnant, hiding your tummy. The skirt can be narrowed or flared (most popular is the second option). If you want a wedding dress, made inRussian folk style, and traditional white does not suit you, note the incredibly beautiful sundress. Through colorful colors, you can put it on almost any event. Scheduled for a celebratory feast in the open air? Dress - the perfect choice. To image looked harmonious and complete, use this accessory as kokoshnik. When you create a sundress in the Russian stylesuch a conventional element used as bright fabrics. Wearing this, you will not only stand out from the crowd, but also to attract everyone's attention, will emphasize their own individuality. If you do not like too bright colors, do not worry, because the designers are also models in their collections in a more soothing colors, pastel shades. Dress made in the Russian folk style,perfect not only for weddings but also everyday wear - walking around the city, meeting with friends. This fashionable thing! Very nice and stylish look shorter models, which combine folk motifs, amazing decor and modern fashion trends. As such, you can take a walk around the city or go on a romantic date with her lover. To get as close to the Russian folk style, do not forget about the hair and makeup. Easy to cut, fashion floral prints make ofeach girl a real Russian beauty. The main focus of these sundresses - embroidery stones, colored threads, beads, ribbons. Very interesting and unusual look this outfit in the form of a short scarf. In these dresses, you can spend an interesting, unusual themed photo shoot, for which it is best to select the extended model of any cut - from direct and long skirts to bell. Modern women's clothes made in Russianstyle may be considered too fanciful, colorful, and some models are very similar to the dress-shirt. But the way it should be! These fashions are complemented saturated colors, embroidery patterns. Attire should be made only from high-quality natural fabrics, such as cotton or linen suit. Sleeve-lanterns, printed patterns, ornaments Gzheli favorably emphasize Russian style, a dress should not be too short or have a deep cleavage. At the peak of popularity were stylizedwedding. 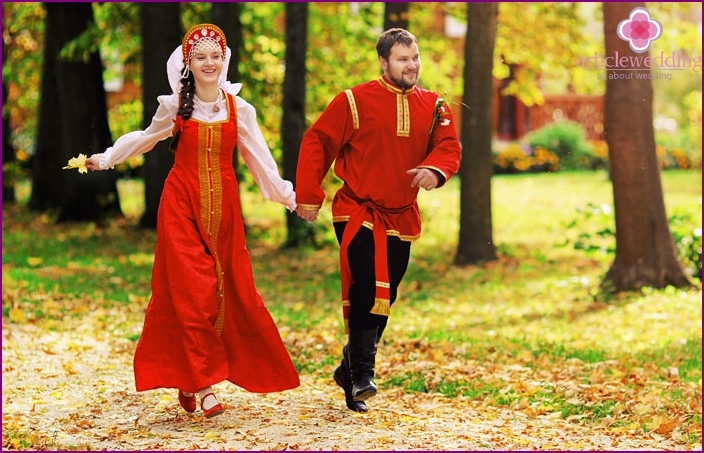 If you choose the Russian folk style, you need to choose the right wedding-dress - red sundress, complete with colorful embroidery. This outfit can be slim or wide style of the chest. Looks nice addition sundress inserts stones, bottom worn linen white shirt, having straight sleeves. If you follow all the folk traditions, while at the head of the bride should be kokoshnik, decorated with sequins and colored stones, hair braided with ribbons.